Are you concerned about your dental health? Are you missing teeth and wish there was a permanent solution? Infinite Point Cook Dental specialises in complete dental restoration. Whether you’re missing one tooth or multiple teeth, our passionate and experienced dentists offer state-of-the-art dental implants to illuminate your smile and safeguard your complete dental health. Try as you might, teeth loss is a reality millions face each and every year. Whether through tooth decay or blunt-force trauma, tooth loss affects far more than your appearance. In years past, removable appliances, such as dentures, were the primary solution for dental restoration. Enhanced Appearance – Our implants are carefully selected to perfectly match your surrounding teeth. Get ready to smile bigger than ever before! Structural Integrity – Made out of the latest implant technologies, our procedure safeguards jaw bone health and chewing comfort. Complete Dental Health – Missing teeth eventually causes surrounding teeth to shift, which is painful and detrimental to your dental health. Our implants prevent teeth movement to ensure years of a healthy, happy smile. Our dentists in Point Cook are active members of the Australian Dental Association and hold great interest in the latest technological advancements in dental care. While implants aren’t new, our procedures and actual implants use state-of-the-art technology to restore and protect your smile. Your mouth is uniquely yours. Much like fingerprints, your dental alignment and situation can’t be compared to others. To determine the best implant option, your dentist performs a thorough physical and digital image evaluation. Once fully analysed, our dentists may recommend any of our three leading implant options, which include: Straumann, Osstem and Dentium. While each implant is considered the leading choice, not all implants are perfect for your case or budget. Even though an implant may not be universally recommended, the results are definitely universal: a perfect smile without the pain and embarrassment of missing teeth. Dental implant procedures are done in-office by one of our experienced and passionate dentists. Our goal is to make you as comfortable as possible through impeccable hospitality and a commitment to delivering the highest quality results in as little time as possible. 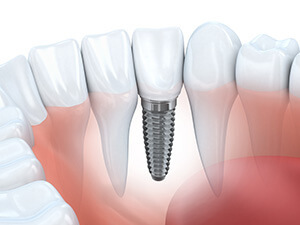 Are you considering dental implants but aren’t sure if they’re the best choice? Call (03) 9395 8400 and book your initial consultation today! With over 40 years of combined experience, you can trust our dentists for both major and minor restorative procedures. Isn’t it time to experience the beauty and comfort of an effortless smile? Book your appointment and start your journey to complete dental restoration!